This past weekend, I went over the most indicative recession macroeconomic signals, and I got a feel for what contacts of mine, who manage funds of some very rich individuals, are doing right now, as well. I wanted to get the pulse on how professionals are positioning right now, in light of pressures, expressed by panicked clients. The bottom line, though, is that with all of this mayhem, no one is shorting stocks yet in a significant fashion. In other words, there is plenty of concern, in general, but in the big picture, money managers and clients know that the economy is still doing quite well. They are much more upset over political and societal issues than about business ones. With record profit margins and the recent price corrections, stocks are not as expensive as they were in January – that’s for sure. They’re back to 2016 levels, before the rally even began. On the other hand, the consensus of my contacts is that the world isn’t the same as it was in January, neither, so we must look at data from new lenses. 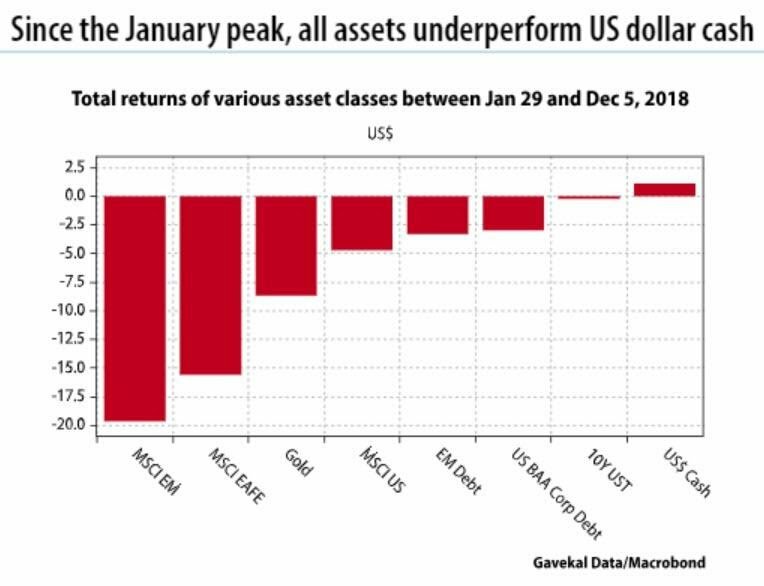 The dollar has outperformed every other asset class on the planet for an entire calendar year, a fact that has totally changed the portfolio allocation and the trading strategy for us, going forward. Wealth Research Group has been shying away from gold and silver investments in 2018, since the USD’s strong performance is the worst catalyst for precious metals. It curtails any demand for increased allocation towards commodities, in general. Oil has collapsed, and China has slowed down. 2018 couldn’t have been more bearish for natural resource stocks, with 95% of them hitting 52-week lows in September. This is, obviously, an extreme, the opposite of a bubble – a wipeout, essentially. Now, what we want to see is the reversal, which is lengthier than just a quick bounce. In the next five weeks, as December ends and another January begins, the winds will blow either to the side of resumed investor confidence in the business cycle (JP Morgan’s official outlook), or it will take a breather, allowing problems to be solved, while trading sideways or down, as the dollar heads down, emerging markets rally, and commodities follow (Bank of America’s official outlook). The second outlook, that of a breather, a pause, a time for solving issues, or at least of chewing through them, or for taking stimulating measures, followed by the blow-off top rally in the second half of 2019, as we head into 2020 (an election year), is Wealth Research Group’s stance. In 2016, between January and August, gold and silver stocks soared wildly. It was sensational, indeed. It was caused by a short squeeze on the miners. Many NASDAQ investors like to hedge, by betting against mining companies. Now, like then, short-sellers are heavily positioned in the mining sector. If they must, again, liquidate and dispose of their positions, as gold and silver rise, we could see a repeat of 2016. 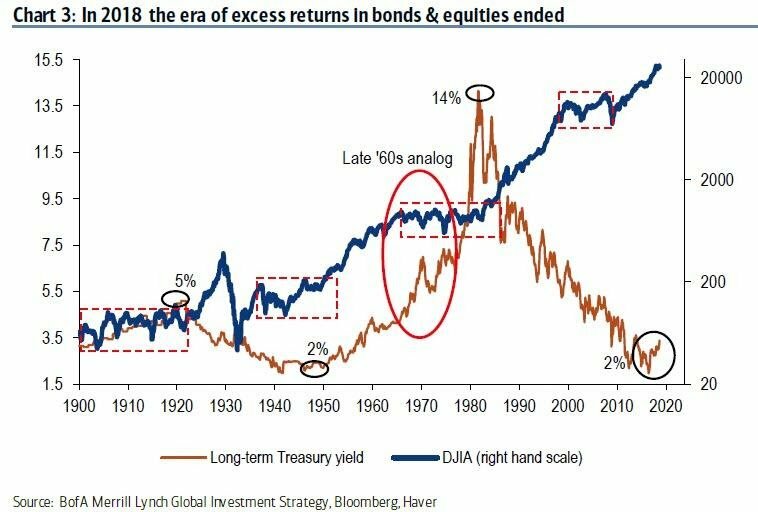 Every yield inversion phase has led to a gold boom, especially if inflation was still within range, when it began, as it is right now. So, to really make things bullish and solid for us, we need to see (1) bulls afraid of buying the dip, (2) wages continuing to rise, while unemployment peaks, (3) the dollar showing signs of rally exhaustion, and (4) silver to begin catching-up with gold. Watch these four stats closely because no other newsletter on the planet is as equipped with the tools to maximize a gold stocks rally as this one!